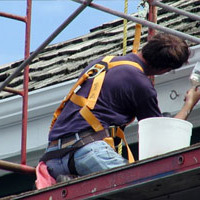 Scaffold provides a stable aerial work platform that is invaluable when installing siding or painting. We carry both exterior and interior-type modular scaffolding. Scaffolding rentals are very affordable, and can help you reach the toughest spots with ease. We carry 24’, 32’, and 40’ extension ladders. We carry a range of heavy-duty extension ladders – their tough box-rail construction allows for an impressive weight capacity rating of 300 lbs. Above rates for 24' ladder; see below for 32' and 40' ladder rates. This “Multi-Way” ladder can be set up to perform a variety of tasks, making an effective trestle-, stairway-, step-, and extension-ladder. 8/13’ spread. The “Jaws” ladder’s unique telescoping legs and hinge-lock system allows it to be locked in a closed, step, or extension position – a versatile tool. This lightweight Orchard ladder is great for landscaping jobs – it uses a tripod system to allow you to get deep into trees for pruning or picking. See rates below for 14' and 16' orchard ladders. Various stepladder sizes are available. These heavy-duty industrial stepladders have high-strength spreader bars and side rails, giving these ladders an impressive 250 LB capacity. For 14' step ladder, please see rates below! Various extension ladder heights are also available. A single, non-extending heavy-duty ladder. Designed to support planks across two ladders, our ladder jacks feature an 8-way pitch adjustment for level mounting inside or outside the ladder. Rental includes a pair of ladder stand-offs. Our stand-offs are designed to keep your ladder away a safe 14” from your working surface, resting against a wall, over gutters, or onto the roof. These lightweight aluminum planks have a 500 LB capacity and are designed to be used with ladder jacks, sawhorses, or pump jacks. Easy to set up and tare down, even by a single person. When conventional scaffolding won’t do, consider using our Baker scaffold. These complete units measure 6’ × 6’ × 29”, have adjustable deck heights, locking wheels, and ends that can be staggered for safe usage on stairs. Perfect for all types of indoor work, these units easily break down for transport, can be assembled by a single person with no difficulty. Guard rails and outriggers are also available to enable this scaffold to be set up to 2 sections tall = 12’ tall freestanding, for hard-to-reach-indoor projects. Additional charges apply. Accommodate any possible setup with our easy to transport modular scaffolding system. Our scaffolding is rented out by the individual piece in order to accommodate any possible setup. The 5’ × 5’ frames fit at the ends of the scaffold, while the braces, which determine the width of the scaffold, form an X and brace the two frames together. Multiple stages can be fitted together (vertically and/or horizontally). Banana pins are included with rental of scaffold frames. Cost is only for rental of extra pins.